Professor Jim West giving a speech about the year 1968. Students gathered to join a panel of professors to discuss events that occurred in the year 1968 through each professor’s disciplines in the Community Room located in the Winn building on Sep. 25. 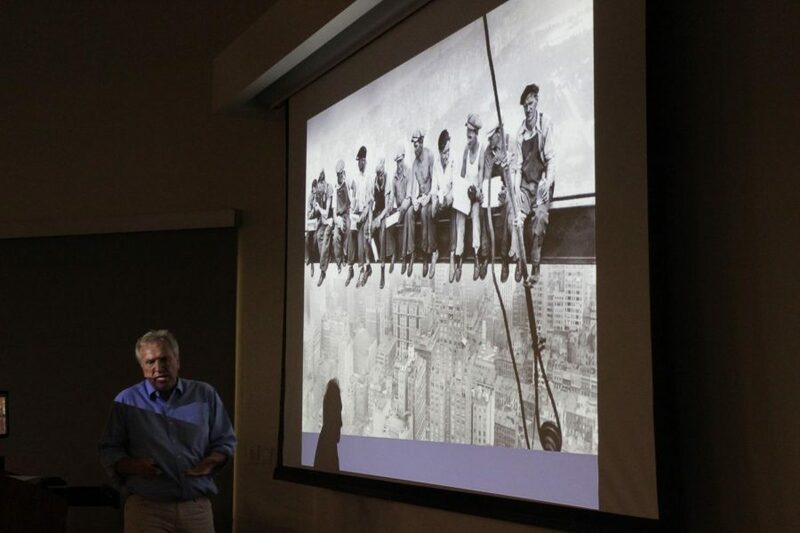 Professors Elizabeth Huffman, Diana Reed, Alex Peshkoff, Nyenbeku George, Jim West and Martin Morales each shared different perspectives such as a sociological and photographic aspect of the year 1968. “When you have a bunch of professors who have different disciplines but they’re all working towards the same type of goal, you get multiple views and vantage points, something that you don’t get from just that class’s view,” said David Miranda, a 21-year-old social science major who attended the event. West shared a collection of photographs some of which included imagery involving war and child labor. “Imagery is more important than anything that we’re seeing nowadays,” said West. Amani Heilman, an 18-year-old English major, said she really enjoyed learning more in depth about the event. Cathy Lemelin, a 66-year-old science major, said she was interested in the event to learn more about 1968 from a historical perspective. “I didn’t understand as a sixteen-year-old girl, being that bitter, but from a historical perspective I understand his bitterness,” said Lemelin. Miranda said it was a well organized event that covered an international aspect of 1968. Reed said that historians look at the cycles in our history to understand why similar events occur more than once. “We are living in an exciting time and thinking of a lot of the movements that are happening right now and there are some aspects when history does repeat itself,” Reed said. Morales said he and George were discussing the anniversary of Dr. King’s assassination and the events that took place after which sparked the idea to organize this event.